A composting facility formerly proposed for construction in the Bellevue Triangle could find a home at Ohio Gulch, Blaine County commissioners announced last week. "There are details to work out, but this is obviously the right choice," Commissioner Tom Bowman said during a meeting on Dec. 7. The facility was originally proposed in March for a location in the Bellevue Triangle. The plan was canceled when Wood River Organic Recycling, a locally based company affiliated with Cedar Grove Composting in Seattle, withdrew its proposal after an outcry from residents who did not want a composting center nearby. The new mid-valley location is already home to a recycling center and a waste transfer station, meaning that the traffic, odor and noise concerns that disturbed landowners near the proposed Bellevue location are not applicable. The center will turn residential and restaurant food waste, along with yard waste such as grass clippings, into products such as compost and potting soil. According to Jim Garrison, project manager for Wood River Recycling, local garden centers such as Lily and Fern and Moss Garden Center are already using these products. Schoen said that despite county involvement in the development of the concept of composting at Ohio Gulch and conducting a request for proposals for the new facility, the center would be privately owned. "This is not going to be a county-run operation," he said. The county would contract with Wood River Recycling to provide composting service. Schoen said that would allow the county some oversight over how the center is run. The potential contract was awarded following an open bidding process. The county received two proposals, the other being from Sawtooth Compost, but Schoen said Wood River Recycling's proposal "won on all levels." As for how the county will be compensated for use of the land for what will likely be a profitable composting center, Schoen and Gina Uberuaga, spokeswoman for Wood River Recycling, said details have not been worked out yet. Uberuaga said Wood River Recycling had not received anything in writing, nor had it signed a contract for services. However, she said, the company's owners are excited about the center's potential. "Whether we were awarded the contract or not, we are just happy that the county and the [Southern Idaho Solid Waste] district are interested in pursuing further recycling opportunities," she said. Schoen said Clear Creek Disposal, a local trash collector, has indicated it would be willing to collect food waste and other compostable materials from homes and businesses in the valley. One proponent of the new center is Chris Kastner, owner of CK's Real Food restaurant in Hailey. Kastner maintains a seasonal composting pile, but it can't be used in the winter and there is some material that he cannot compost. Meat and other plate scrapings cannot be disposed of via private composting piles due to the threat of scavengers. 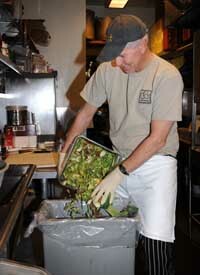 Kastner said that on days when the restaurant serves lunch and dinner, he fills two 50-gallon trash cans full of food waste from prep work and scraped plates. That waste goes to a landfill in winter, but could be composted easily at the new center. "It would just be awesome," Kastner said. "If every home, every business turned in that waste, it would be pretty cool."